Swim Guide wants to help you find the best beaches in Southern Ontario for this August long weekend. There have been many issues affecting beaches in Ontario, such as historic flooding and higher than normal levels of bacteria in the water. For the August Long Weekend 2017 Swim Guide recommends these Southern Ontario beaches for their consistent excellent water quality (they passed water quality test more than 95% of the time in 2017), and the beaches’ popularity with our users. We’ve also confirmed that these beaches are open this summer. Jack Darling Park is a large, full-service park with a long stretch of swimming areas, tennis courts, picnic areas, and the spectacular Rattray Marsh. The Marsh is the only one on Lake Ontario between Toronto and Burlington. This park has a great mix of sandy beaches, natural waterfront areas, and recreational parkland. It is a great refuge on hot summer days. The views of the Toronto skyline are fantastic, making it one of the best places to watch the sunrise over Lake Ontario. This beach is part of a strip of sand separating Hamilton Harbour from Lake Ontario. This natural strip is known as a barrier beach, or a “Daonasedao” by the area’s original inhabitants (“where the sand forms a bar”). In the early 20th- Century, this popular destination featured live jazz, a carousel, pony rides, and even a roller coaster. Beach Park in Hamilton is the southern sister to Beachway Park in Burlington. It stretches south from the canal entrance to Hamilton Harbour. Pickering Beach is located in the community of Ajax just off the shore of Lake Ontario. 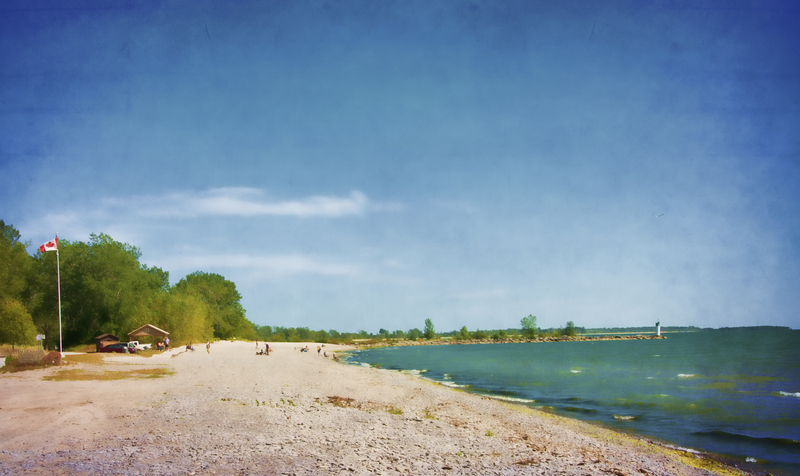 Pickering Beach was an important cottage destination for upper-class Torontonians in the 1920’s. Some famous figures that lived in the community are T. P. Loblaw and artist Florence Helena McGillivray. Today the beach is a great place for swimming and fishing. There are volleyball courts, picnic areas, and a beautiful lakeside boardwalk for biking, running, and walking. Bird watching in the area is reputed to be fantastic, as are the neighbourhood restaurants. Port Stanley Little Beach is located in the eastern part of Port Stanley not far from Main Beach, and is best suited for families with small children. The beach has shallow water and is well protected by the east berm making it more secluded. Little Beach boasts a sandy beach stretching 185 metres long. Parking and port-a-potty bathrooms can be found just off Main Street. Grand Bend’s South Beach is located on the Lake Huron Shoreline in Lambton County. South Beach is the quieter of the two beaches in Grand Bend (North and South Beach) and is the ideal destination for families. Grand Bend’s beaches are a popular destination for tourists and locals because of the long, sandy beaches and warm water. South Beach is accessible by path from Lake Road or River Road. 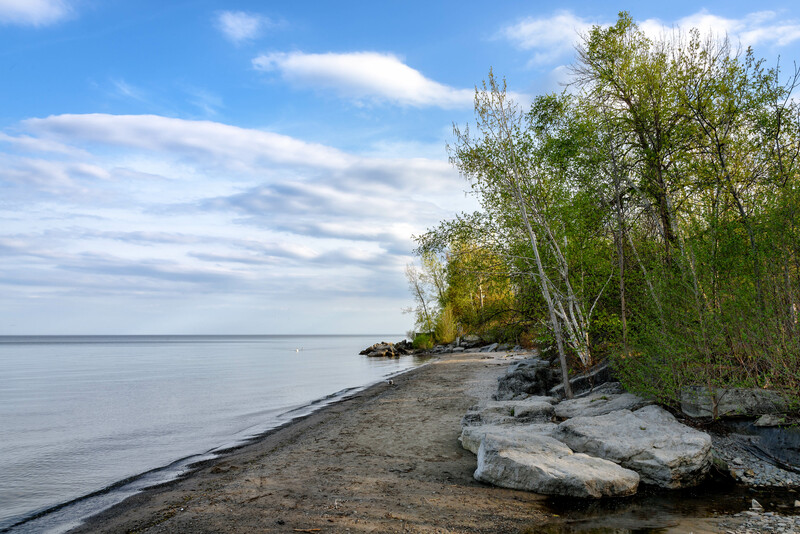 Franklin Beach is a small, sandy beach owned by the Lake Simcoe Region Conservation Authority. There is no parking directly associated with this beach, but parking (paid for non-residents) is available at nearby De La Salle Park. Portable washrooms are available (May-August). Sauble Beach is located in the resort town of Sauble Beach on the south Bruce Peninsula. Situated on Lake Huron, Sauble beach is extremely popular among tourists due to its warm water, long sandy beach and recreational activities such as beach volleyball. Beach facilities include change rooms, restrooms, and lifesaving stations. The beach is in close proximity to the restaurants, entertainment and shopping of Sauble Beach. When visiting Wellington Beach, be sure to take note of several improvements courtesy of the local Rotary Club in 2009. There are thirteen different interpretive signs here to help you understand the local history and natural environment. The east and west beaches at Oshawa’s Lakeview Park stretch across a long sandy shoreline located within an expansive waterfront recreation area. Soccer fields, slow pitch diamonds, picnic facilities and outdoor and indoor concerts can all be found in the area. At the most eastern end of the beaches, you will see the industrialized harbour. Across the harbour is Gifford Hill, a historic site that served as a trading post during the 18th century. One of the few remaining pioneer cemeteries in Ontario can be found in this area. Beyond Gifford Hill is Second Marsh, a 123 hectare coastal wetland that is home to extensive biodiversity such as reptiles, mammals, birds, fish and insects. Walking trails, viewing platforms, and benches are among the many things available in the green space of the beaches where everyone can find something to appreciate and enjoy outdoors. Roblin Lake is a rare kind of “lake within a lake”. It is nestled in Prince Edward County and is a kind of “fossil water”, a pool left behind by the glaciers that was once connected to Lake Ontario. Roblin Lake is home to one of Canada’s most famous A-frame log cabins, built by one of the country’s most famous poets: Al Purdy. Ipperwash Main Beach is located along the shores of Lake Huron in the Municipality of Lambton Shores. The beach is a good alternative to the more populated Grand Bend beaches. The shallow waters of this sandy beach make it a great place for families, but there is no lifeguard supervision. There is parking near the beach and there are three beach access points at West Ipperwash Road, Ipperwash Road and Army Camp Road. The beach is right beside Ipperwash Provincial Park. This beach is near Madoc, Ontario. There is a boat launch nearby. This town was once an important stopover on the road from Toronto to Ottawa. It is named for a Welsh prince believed by many people to be one of the first Europeans to discover America in the 12th Century. In 2010, a group of local residents announced plans to reinvigorate the area, so expect more beach improvements to come! This park is the largest waterfront park in Peel, with more than 40 hectares (104 acres) of public space. The beach is an inlet off of Lake Ontario. It is shallower, warmer, and more contained than most beaches on the lake. Jackson’s Point Harbour offers many amenities including a playground and green space with picnic tables and a shelter. This beach has public washrooms from May to August and parking (paid for non-residents).